Vaibhav Global is in space of Lifestyle products. As per the Company website it is electronic retailer of fashion jewellery and lifestyle products in the USA and United Kingdom on its TV Shopping channels – ShopLC, USA and The Jewellery Channel (TJC), UK. The TV coverage is complimented by e-commerce websites/mobile apps www.shoplc.com and www.tjc.co.uk. VGL group also engages in traditional B2B wholesale distribution through STS Jewels that serves various retail chains in USA and UK. The manufacturing facility of the Company is situated in Jaipur. Vaibhav Global is ranked 162 in Fortune India’s next 500 in year 2018. In year 2017 it was ranked 219. So the company have moved up by 57 places in one year. This is very good achievement by the Company. The main market for it is US and UK. So the benefit of currency depreciation will go to the company. The company is expanding its footprint to other countries as well. Now lets see how well the company has performed for Investors over the years. That will be real litmus test for the company. 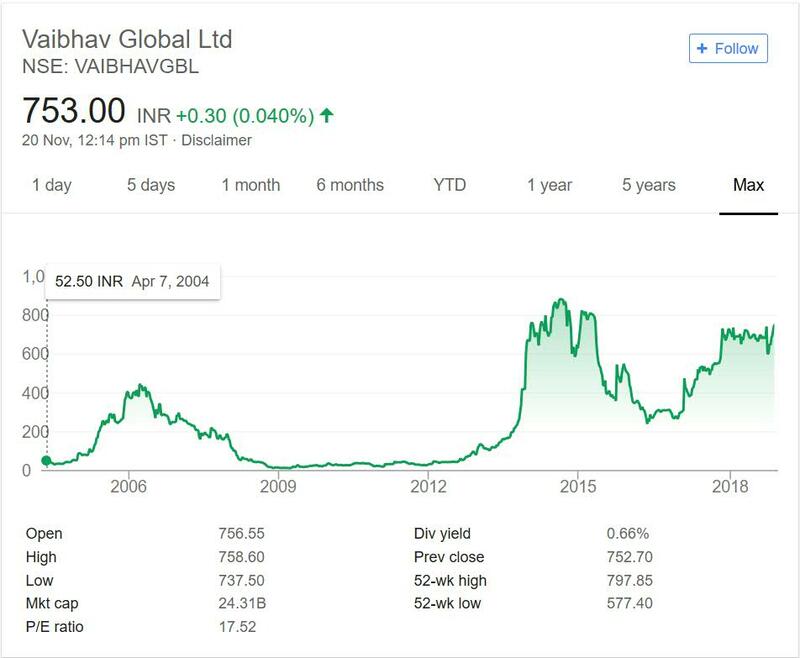 Below graph shows performance of Vaibhav Global over a period of 16 years or so. This will give you good idea of how well the company has performed. I have taken long period as that would eliminate any cyclic movement of the stock. As per Dow theory price is best way to judge Company performance. Above chart is very interesting. During year 2004 the stock was trading at 50 odd levels. It zoomed past 400 in next two years making very good money for Investors. But from that peak it slowly moved downhill. The global crisis of 2008 did not help either.The stock price moved below the 2004 levels and continues near that mark till year 2012. It was not recovery but flat performance by Company. The stock consolidated near that mark for quite sometime (years). Then again there was sudden spike in year 2013 to 2015 taking the prices near 800.Then again it plunged suddenly to below 400 level. It again rose to above 600 level. The problem with graph is sudden rise and plunge in prices. This makes it cyclic and very unpredictable stock for investing. The dividend yield is decent (below 1%) at current market price. The only problem with stock is steep rise and fall in prices. This makes difficult to have a entry and exit point in it. Vaibhav Global is in portfolio of Vijay Kedia. He is one of the top investors in India. You can see it as IT or Pharma company. The reason is simple. Company mainly focus on Lifestyle products market in US and UK. The export plays a major role in revenue just like Pharma and IT. So things like currency depreciation and any regulatory changes will have same impact on it as they impact Pharma or IT. Lifestyle products is good niche. It targets end users and is every growing sector. There is competition as well and company will have to innovate continuously to stay in front. Past is always a reflection of future. The price fluctuation of past does not impress me personally. I do not like companies going steep movement upwards and downwards. It did not happen once but thrice in last few years. So this sudden movement indicates unpredictability in company operations and working. You can add Vaibhav Global to your stock watch list if you want to invest in a life style products company. But as mentioned above you should take a close look at reasons company have swift movement in past. These swift movements are alarming. You may invest at a price and then company moves very fast downwards giving you no time to exit from your position. Those downward movement reasons should be explored. If the chances of them recurring in future exists then you should plan it out before investing. Download for Free. Enter your Email to get download link.